← Creamy Soba Noodle Bowl with Rainbow Veggies. Fill a large pot halfway with water and bring to a boil. Peel and grate or mince the ginger; transfer to a large bowl. Add peanut butter, honey, water, tamari, vinegar, chili-garlic sauce, and sesame oil to the bowl with the ginger. Whisk until smooth, set aside. Once water is boiling, add salt and noodles and stir for a few seconds. Cook according to package directions, 3 to 4 minutes. When cooked, drain and rinse well under cold water. Trim off and discard the ends of the green onions; cut the onions crosswise into ⅛-inch pieces at an angle. Cut the bell pepper lengthwise into quarters; remove and discard the seeds and white membrane. Julienne the pepper. Trim and discard the ends of the cucumber; halve the cucumber lengthwise and then slice into ⅛-inch thick planks. Then, cut the planks ¼-inch wide julienne sticks. Trim the stem ends of the carrots and peel; julienne or coarsely grate the carrots. Trim off and discard the root end of the cabbage; halve the cabbage lengthwise, then thinly slice crosswise. 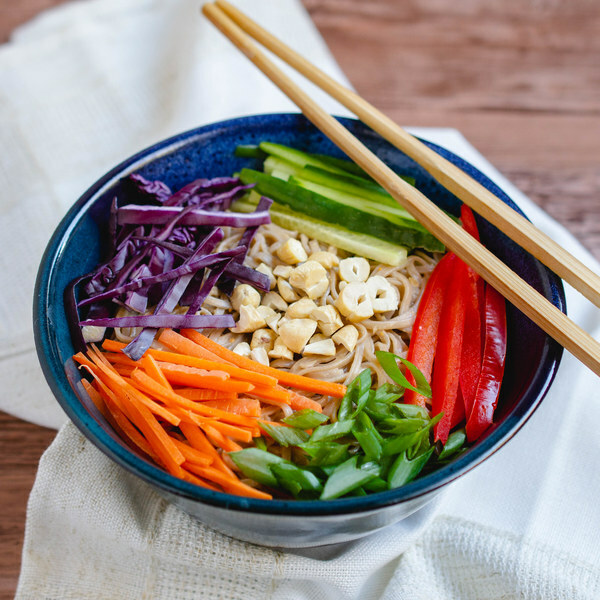 Add noodles, cashews, and veggies to the bowl with the dressing and toss to combine. Divide noodles between plates, serve cold. Enjoy!